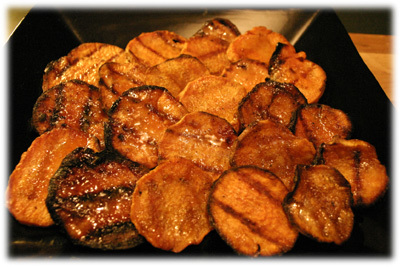 Oven-roasted Potatoes Au Gratin - on your BBQ! Wouldn't it be nice if you could could get your gas grill to help out a little more around the house? How about a little comfort food when you need it? Now you can! 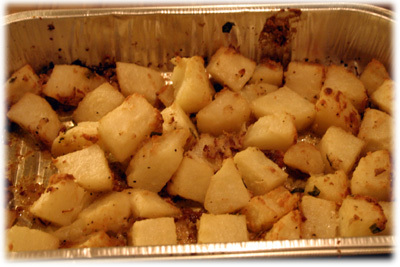 With this potatoes au gratin recipe you get exactly the same comforting oven-roasted potato recipe on your grill as you would in your home. In French Au Gratin generally means anything grated on top, like breadcrumbs or cheese. In this potato Au gratin recipe we've skipped the bread and head straight for the cheese! 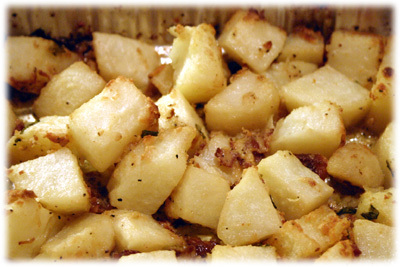 Adding some crispy bacon and green onion rounds out the flavor of this delicious grilled potato recipe. The bonus to using your grill, in the summer it prevents over-heating the house and if you grill in the winter (why not?) then it free's up your oven for other dishes. 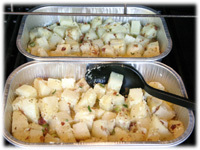 Place all the peeled, cubed potatoes in a resealable plastic bag with the 1/4 cup oil. Swish the potatoes around to fully coat them in the oil. Add the garlic powder, Parmesan cheese, mustard powder, salt and pepper - reseal the bag and swish the contents to fully coat the potatoes with this mixture. Pour into the aluminum pan(s). 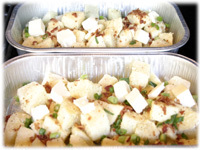 Cover the potatoes with the chopped green onions, bacon and the cubed butter. Preheat the grill to 475F - 500F and set up for indirect grilling. 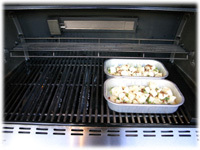 When the grill reaches temperature place the tray(s) of Au gratin potatoes on the grill not over direct heat. Every 15 minutes rotate the trays around so the potatoes are evenly heated. Stir the potatoes and close the lid of the grill. 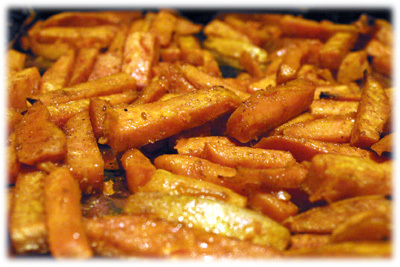 When the potatoes are cooked (crispy and a fork penetrates them easily) remove them from the grill and serve immediately. Offer grated cheese and sour cream on the side to garnish.